As a result of Iraq’s invasion and occupation that began on 2 August 1990, Kuwait sustained significant and widespread environmental damages, including loss of habitats and disturbance to ecological equilibria. Upon evacuation, the Iraqi troops set fire to over 700 oil wells in several Kuwaiti oil fields, with significant amounts of toxic metals and carcinogenic constituents released into the atmosphere for several months. Approximately half of the oil evaporated and more than a million barrels were confined in large pits carved out of the desert. These massive emissions caused serious concern over possible catastrophic environmental consequences within and outside the Gulf region. In addition to the damages caused by the release and burning of oil and destruction of oil wells, the desert environment also suffered from fortifications and military movements. 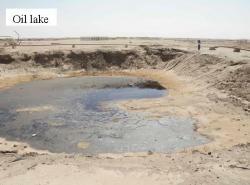 The groundwater deposits were impacted in many places by the seepage of oil and chemicals through the layers of sand. These damages were of epic proportion and much of whatever little was available as natural environment was lost during and in the aftermath of war. Further, at least 80 ships were sunk during the Gulf War, many of which carried oil and ammunitions. These shipwrecks still represent a chronic source of contamination of the marine environment. 114 km² of desert area severely affected by dozens of oil lakes and over 26 million m³ (cubic meters) of contaminants that need to be removed into landfills. In addition to the the above, further damage resulted as a result of the disposal of ordnance, unexploded ordance (UXO), and desert, coastal, and marine ecosystems were disturbed. In recognizing the need for large scale environmental remediation and restoration, the Commission awarded approximately US$3 billion in compensation to the State of Kuwait. Overviews of the projects being undertaken by Kuwait with these award funds are set out on a per claim basis below. Kuwait was awarded US$41,531,463 to treat and remediate groundwater within the only two freshwater aquifers in North Kuwait, namely Raudhatain and Umm Al-Aish. Those aquifers were contaminated as a result of the infiltration of seawater used to fight oil well fires, contaminants from oil recovery pits and oil lakes, and leakage from damaged oil well heads. Kuwait was awarded US$3,990,152 to remediate marine and coastal areas as a result of contamination from more than 12 million barrels of oil released through a combination of offshore oil spills, the creation of a coastal oil-filled trench and oil deposits, wreckage of oil tankers and spills on offshore islands from tipped-over oil-filled tanks. The State of Kuwait was awarded US$643,814,034 to remediate vast areas damaged by the remnants of war (military fortifications) and effects of damaged oil installations. There are four elements under this award with projects plans in place for each of the elements. The 1990 invasion of Kuwait and subsequent ignition of hundreds of oil well fires and the release of million barrels of crude oil into the Persion Gulf resulted in one of the largest deliberate man-made disasters on record. Although most of the discharged oil beached in Saudi Arabia, its effects on Kuwait’s marine ecosystem were substantial. Oil-spill related contamination impacted approximately 0.78 km² of shoreline resources. The war resulted in the disposal of ordnance at three open burning/open detonation (OB/OD) sites. The project plan provided for clearing the UXO, levelling berms and restoring the natural topography, the stabilization of soil in disturbed areas to promote natural recovery, and revegatation. While the F4 Panel recommended that gravel be utitlized to stabilize the soil, the Governing Council approved a modification proposal allowing for vegetation rather than gravel to be used. Implementation of this project has been substantially completed.